That FST maps the sorted words mop, moth, pop, star, stop and top to their ordinal number (0, 1, 2, ...). As you traverse the arcs, you sum up the outputs, so stop hits 3 on the s and 1 on the o, so its output ordinal is 4. The outputs can be arbitrary numbers or byte sequences, or combinations, etc. -- it's pluggable. Essentially, an FST is a SortedMap<ByteSequence,SomeOutput>, if the arcs are in sorted order. With the right representation, it requires far less RAM than other SortedMap implementations, but has a higher CPU cost during lookup. The low memory footprint is vital for Lucene since an index can easily have many millions (sometimes, billions!) of unique terms. There's a great deal of theory behind FSTs. They generally support the same operations as FSMs (determinize, minimize, union, intersect, etc.). You can also compose them, where the outputs of one FST are intersected with the inputs of the next, resulting in a new FST. There are some nice general-purpose FST toolkits (OpenFst looks great) that support all these operations, but for Lucene I decided to implement this neat algorithm which incrementally builds up the minimal unweighted FST from pre-sorted inputs. This is a perfect fit for Lucene since we already store all our terms in sorted (unicode) order. The resulting implementation (currently a patch on LUCENE-2792) is fast and memory efficient: it builds the 9.8 million terms in a 10 million Wikipedia index in ~8 seconds (on a fast computer), requiring less than 256 MB heap. The resulting FST is 69 MB. It can also build a prefix trie, pruning by how many terms come through each node, with even less memory. Note that because addition is commutative, an FST with numeric outputs is not guaranteed to be minimal in my implementation; perhaps if I could generalize the algorithm to a weighted FST instead, which also stores a weight on each arc, that would yield the minimal FST. 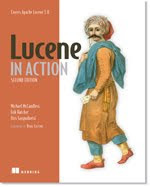 But I don't expect this will be a problem in practice for Lucene. In the patch I modified the SimpleText codec, which was loading all terms into a TreeMap mapping the BytesRef term to an int docFreq and long filePointer, to use an FST instead, and all tests pass! There are lots of other potential places in Lucene where we could use FSTs, since we often need map the index terms to "something". For example, the terms index maps to a long file position; the field cache maps to ordinals; the terms dictionary maps to codec-specific metadata, etc. We also have multi-term queries (eg Prefix, Wildcard, Fuzzy, Regexp) that need to test a large number of terms, that could work directly via intersection with the FST instead (many apps could easily fit their entire terms dict in RAM as an FST since the format is so compact). The FST could be used for a key/value store. Lots of fun things to try! Many thanks to Dawid Weiss for helping me iterate on this.